The pressure and/or suction that is created by your filtration or circulation pump. The differential pressure that occurs between the the suction and pressure side of your swimming pool pump. There are some erosion dry chemical feeders, that use a mechanical gate or rotating screw to move the granules into the path of the flowing water. It is during this process, that the granules are dissolved in the water which is then fed into your swimming pool. Dry chemicals not only come in granular form. They can also be purchased in tablet form which come in various sizes and shapes. Dry erosion feeders that use the larger size chlorine tablets (3 inch), have a plate installed inside that prevents the tablets from being completely submerged in water. This separation plate has holes that allows the stream of water to hit the bottom of the tablets; thus, causing them to slowly erode and dissolve. You can find this concept or type of erosion design in a PPG Power Base chlorination system. An example of one is pictured below. Some times a dry chemical erosion feed system is installed and operated on the pressure side of your circulation pump. If this is the case, operation of the chemical feeder will depend on a venturi effect (vacuum) to operate. A venturi system is one that creates a vacuum pressure as water (fluid) passes through it. The output or discharge side of your dry chemical feed system is connected to the suction port of the venturi system. During this process, the chemical solution will be sucked into the flow of circulation for your pool or spa. The solubility of the pool chemical product that you are using. The flow rate of the water passing through your erosion feed system. The total surface area of the chemical tablets or pellets that are being exposed to the water stream. The temperature of the water flowing through your erosion device. This is the supply water from your pool or spa. Observing or reading the instructions and operators manuals that come along with your feeder, will help you maximize its full potential. These manuals will show you how to properly install the feeder and properly control it as well. From your operators manual you will be able to determine the pool or spa size...that your feeder/s is capable of treating. As a swimming pool operator/owner, it is vital that you understand the safety information that is provided by the manufacturer on your erosion device. This my friend...will eliminate any potential risks to you or someone else. If you have erosion feeders that are improperly operated, there is a great chance that they could...God forbid...rupture or explode. This is a very dangerous situation which could occur when you or some other attendant is around. This could send the lids as well as pieces of pipe flying through the air. This can cause serious injuries or death. During the operation of your erosion feeder the flow of the water must be carefully adjusted. This is how you will maintain the proper amount of disinfectant going to your swimming pool or spa water system. There are some commercial erosion systems that are installed with one or more flow regulating valves. Some State code regulations may require you to have a flow meter install as well. Dry chemicals that are commonly used in erosion feeders. As I mentioned earlier, dry chemicals not only come in granular form. They can be brought in solid tablet form as well. These chemical tablets can either be solid chlorine releasing or bromine releasing. Emphasis are put on these type of tablets, because they are the most commonly used ones in an erosion feed system. Hence the names chlorinator feeder and Bromine feeder. Pressure erosion dry chemical feeders - These type of feeders are usually installed downstream...away from your swimming pool filters and pool heaters. They are plumbed directly into your filtration or circulation line which by the way...is under full line pressure. If your swimming pool pump and filters are installed below your water surface level, it is important that you have isolation valves installed on each side of your feeder. These valves are closed before opening the unit. They also allow you to carry out any maintenance on the system as well. All erosion chemical feeders that are designed to operate under pressure, must have a bleed off valve. These bleed valves are also referred to as pressure relief valves. They allow you to safely release the pressure inside the unit before it is open. A word of caution: Never open a pressurize dry chemical feeder until you have safely release the pressure within the unit. Your circulation system have enough internal pressure to blow the lid/s completely of your feeder. This is a very dangerous situation because the lid can be launched through the air at a speed that can damage or destroy your equipment. Regrettably, there is also the potential danger of injury or death to the pool operator. Pressure Differential Feeders - Installation of these types of feeders are usually downstream from your swimming pool pump. Pressurized water from your pool pump is fed through your mechanical feeder during normal operation. The return line or discharge side of the feeder is connected to your circulation line. A booster pump that forces the chemically treated water from your feeders to a pressurized line in your circulation system. Through a vacuum pressure that is created by a venturi injector system. The vacuum that is created using the venturi injector, draws the chemical from your feeder directly into your pool circulation line. Through a throttling valve loop system. There is a valve restriction on one side of the loop. When you are installing an erosion dry chemical feeder, your supply water should always be properly filtered. There are some installation that are supplied with water directly from the discharge side of the swimming pool pump. With this type of installation, the outlet to the feeder is connected to the return line in your circulation system. This of cause is after your swimming pool heating system. Installation of this type, uses the pressure drop across your swimming pool filters and pool heater. This is how the positive flow through your feeders is developed and maintained. Spray Erosion Dry Chemical Feeders - These are feeders that are occasionally used with a calcium hypochlorite system. The calcium hypochlorite tablets in these type of feed systems are sprayed with incoming water instead of them being immersed in the water. With this type of dry chemical feeder, a venturi injector system or booster pump is often used. To avoid the build up of calcium scale in the system, it is vitally important that you carry out regular preventive maintenance. Failure to do so will result in your feed lines becoming clogged. As a result of your feed lines being blocked, your erosion feeder will fail. Although these feed system are designed to prevent scale formation, scale can still form and become a problem. The fact of the matter is - calcium hypochlorite has a very high pH and a very high calcium content. If by chance you decide to use this type of feed system, it is very important that the discharge lines from your chlorine erosion feeder have large enough diameters and see that you clean the lines out regularly. Pressure To Vacuum Feeders - This type of dry chemical feed system is relatively in-expensive. The fact of the matter -is that a booster pump or a venturi injector system, is not required for this type of installation. The water flow through this chemical feed system is controlled with a valve. The flow is driven by a pressure differential on your pool system. The pressure differential is achieved when water flows from a portion of your circulation system. This water flow is under pressure which is tapped and redirected. The water flow is redirected through a flow meter and then through your dry chemical feeder. After the water entering the feed system is chemically mixed, it exits your feeder and is returned to your swimming pool. With this type of set up, the water usually returns to the pool upstream from your swimming pool pump which is under vacuum pressure. If you utilize probes to measure the chemical levels in your swimming pool, you must ensure that they are not giving you a false reading. You want to be concern about this because water that has just being chemically mixed...can give a false reading when it passes the head of your probes. 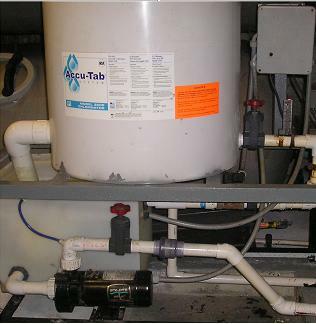 In some chemical feed systems, pool chemicals are metered into what is called a chemical feed tank. The metering process is accomplished by a screw mechanism which is either a mechanical gate or shutter type device. Again the output or discharge of this type of system is drawn into your pool circulation line by a venturi injection (vacuum) system or by a booster pump. When using mechanical dry erosion feeders, the tank has to be properly sized. 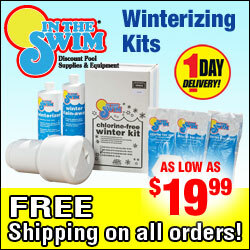 This will allow your pool chemicals the time needed to properly dissolve or erode. The correct size feeder will also allow better delivery of the chemicals to your swimming pool or spa. There are many different types of designs for a dry chemical feed system; hence, you always want to install the one that is right for the amount of water you are treating. Fact: You want a feed system that you can afford and at the same time, one that will properly maintain your pool water chemistry. The safety of your pool bathers is your responsibility; therefore, you have to make sure that your swimming pool water is properly sanitized at all times. So protect your swimmers...try using dry chemical erosion feeders. Erosion feeders helps you eliminate swimming pool contaminants!